Regal Marine’s all new 2800 bowrider for 2015 is only slightly bigger in length overall than its sister 2700 bowrider, but where the 2800 really shines is in its beam which, at exactly nine-feet may only be 6-inches wider than the 2700, but the increase in interior volume created by this 6-inches becomes enormous in terms of increased passenger room and comfort. Because of this increase in interior room, the 2800 provides a logical and reasonably priced “next step” for a family needing the room that a wider beam provides without having to make the giant leap to Regal’s next largest bowrider, the 3200 with its considerably larger 10-foot, 4-inch beam. 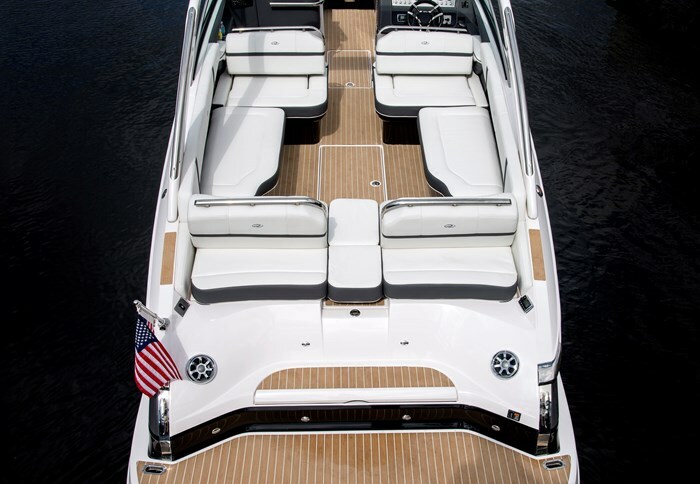 The 2800 is one of fourteen models of bowriders offered for 2015 by Orlando, Florida’s Regal Marine ranging from nineteen to thirty-two feet. All of these except the 3200 ride on Regal’s patented FasTrac hull in which a “cushion of air underneath the hull, created by the mid-beam step, allows Regal to use smaller, more efficient engines to get the same performance and better fuel economy…” Regal offers another thirteen models of cuddy cabins, deck boats, express cruisers, and sport coupes from twenty-two to fifty-three feet. The 2800 is Yacht Certified to accommodate fourteen persons should you ever want or need to have that many on board at any one time but it’s good to know you safely can. Both the helm and companion seats are cosy double-wide, both with flip-up forward bolsters, and both with flip seat backs allowing you to face forward or when facing rearward, allows full surround cockpit seating. 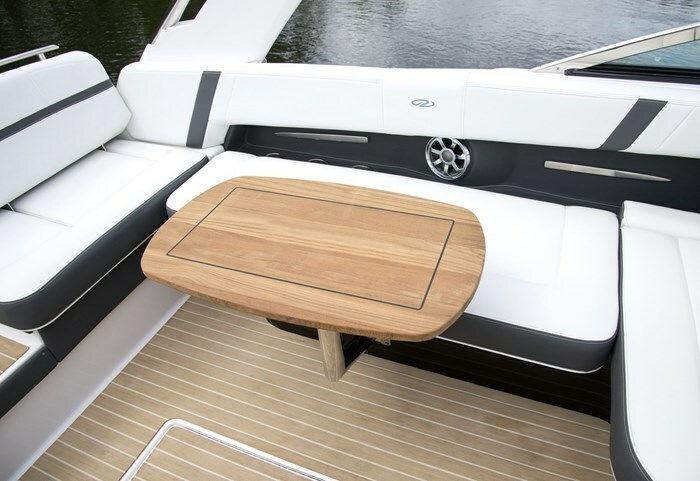 The flip seatbacks of the two double-wide transom seats allow forward or rearward seating, and with the centre transom walk-thru cushion in place, fold down into a full double-wide sunpad. Up front, full lounging or sitting is provided with standard fold-down armrests. All seating has finished storage below with gas strut assisted cushion lifts. Additional storage is found in a huge central in-floor locker. Behind and beneath the helm is drawer storage plus a tilt-out dedicated trash container. There are some noteworthy standard equipment items included with the 2800 that aren’t necessarily found on other bowriders of this size. 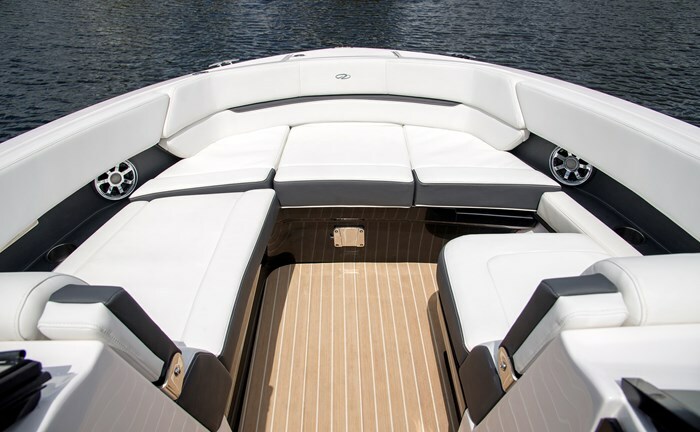 Both bow and transom dedicated and insulated ice chests will keep your beverages cool plus a portable insulated cooler has dedicated under-seat storage. 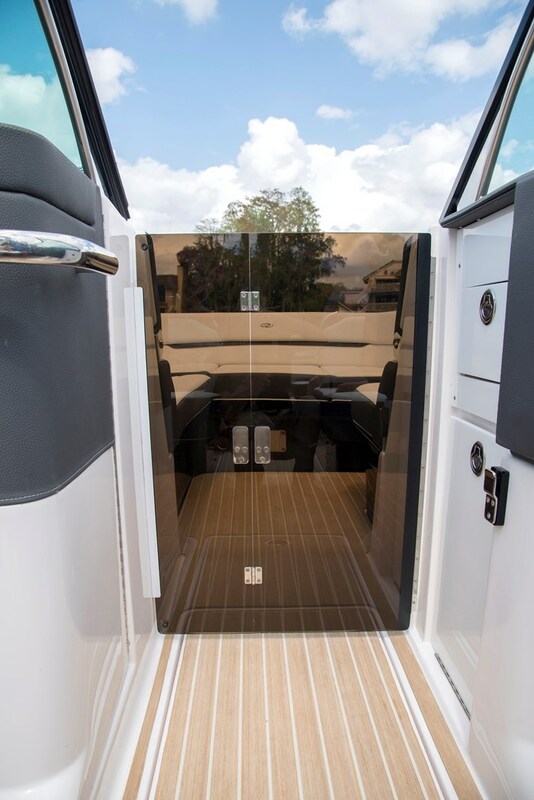 A transom shower is standard as is an on-board pressurized water system supplying the vessel sink in the passenger helm enclosed head compartment complete with cherry cabinetry and a porta-potti. 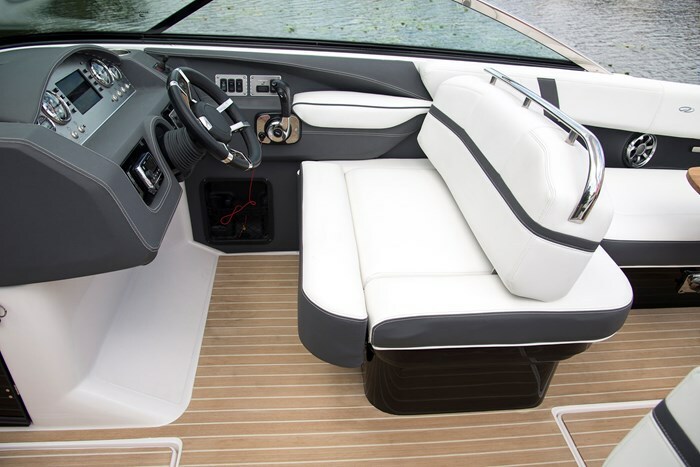 Walk-thru bow doors are standard along with dual batteries, trim tabs, digital depth sounder, Fusion waterproof marine stereo with Bluetooth connectibility plus six, 200 watt cockpit speakers, transom trim switch, stainless steel windshield header, and perhaps most unusual as standard equipment, a powered helm seat and vinyl ester hull bottom barrier coating. A dedicated anchor locker is not unusual, but on the Regal 2800, the anchor roller protrudes through the bow stem allowing the anchor to be lowered and raised without hauling it up and over the bow. The huge, extended and molded-in swim platform sits right at water level when the 2800 is at rest providing easy access for all water activities and Regal offers its optional power platform addition for even easier access. Other notable optional features include a cockpit drawer-type refrigerator, cockpit tables which are part of a Premium Package which includes an anchor windlass and bow filler cushions. 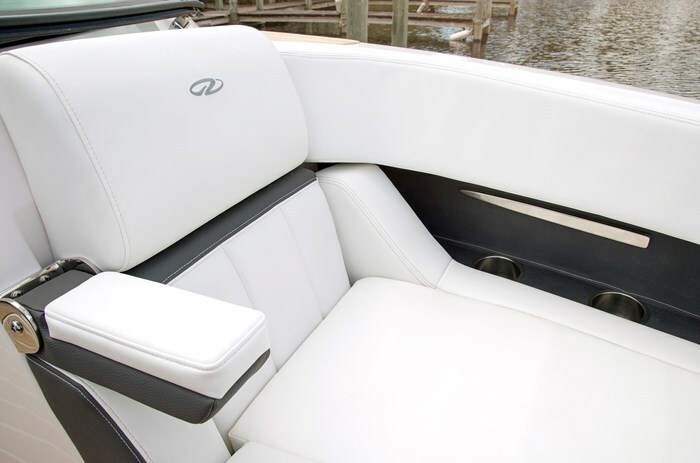 You can choose an RX Package for better watersports enjoyment, a Cold Weather Package with both cockpit and water heaters, a gas grill, regular, Seagrass, or Flexiteek cockpit flooring, electric head, full canvas enclosure, even a bow thruster, plus Regal’s Power Tower – a forward facing arch which retracts down to the windshield at the touch of a button. 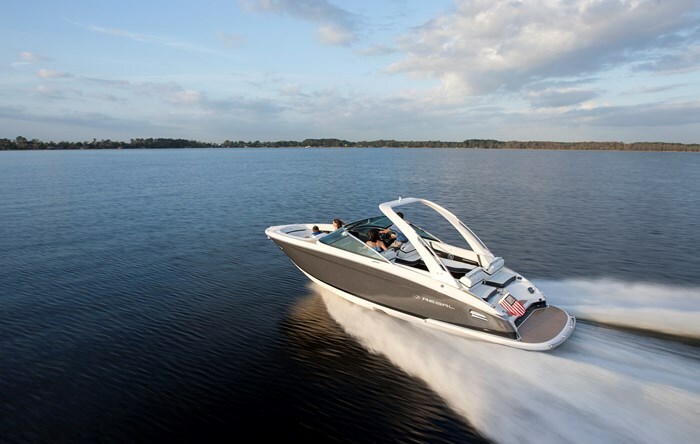 Power for the 2800 is available from MerCruiser or Volvo 380 horsepower sterndrives with Bravo 3 or Duo-Prop drives respectively or upgrade to a 430 hp Volvo with Duo-Prop. With any of these you can add cruise control and/or the RegalVue display. Regal claims this as the world's only multi-functional touch screen display offer for boats in its class. RegalVue displays customizable engine data, GPS navigation, optional cruise control, music and video playback. Regal describes its newest bowrider as “a rare combination of functionality and luxury.” Take the opportunity to check this out for yourself.